1. They are considered as skill apprentices in a literal language. ü It’s the entering level into the oil and gas career. 1. Roustabouts are helpers in the oil and gas stand. 2. It’s basically masculine manly because sometimes it’s tasking and require enough strength to work. WHAT DO THEY HELP WITH? 1. It’s not a profession. 2. It’s a short term position however it requires the employee to have learnt any special skill before he or she is to be promoted. 3. In most cases candidates are required to possess required certification before being employed. 1. Special Certification in Roustabout. 2. Knowledge and certification in Housekeeping. 3. Knowledge and certification in manual Handling. Any activity required of a person to use any part of their muscular or skeletal system in their interactions with their work environment. NOTE: Because the roustabout personnel’s are always involved with manual tasks, then it’s important to know how to do manual handling correctly. When is carrying done wrongly? ü When it has heavy impact on the carrier’s muscles or skeletal system. When is carrying done correctly? ü When a machine is use to carry load instead. ü When a lighter load is carried or when more hands are added. When is Lifting done wrongly? ü When the lifter bends to use his skeletal system. Note: the danger is doing lifting wrongly is fracture or dislocation to any of the skeletal parts. When is Lifting done Correctly? ü When the lifter squats with his back erect and his knees bend as show in picture above. When is Striking done wrongly? ü When it has heavy impact on the strikers muscles or skeletal system and when it’s done for long time. When is Striking done Correctly? ü When its done lightly and in a short period of time. ü When you engage the use of the right machines. When is Pushing done wrongly? ü When the pusher’s skeletal system is involved and or when the pusher’s involves too much of his muscles. When is Pushing done Correctly? ü When it’s done lightly and or the pusher engages the right machines to push to his destination. ü Wrong handling of manual task leads to MSD (musculoskeletal disorder) injuries. ü Poor manual handlings contribute to 30% of workplace injuries. 70% of the roustabout’s work involves manual handling, its highly advisable that intending candidate take it open himself to do manual tasks in the right way. More so, right Manual handling is what recruiters want to watch out for. An inclined spar, strut, or other long member supports the hoisting tackle. Used in Lifting and lowering of load. No thought, Cranes help correct lots of manual handling problems but cranes themselves can be dangerous if proper safety precautions are not apply. 1. INSTABILITY: unsecured load, load capacity exceeded, or ground not level or too soft. 2. LACK OF COMMUNICATION: the point of operation is a distance from the crane operator or not in full view of the operator. 1. Level the crane and ensure support surface is firm and able to support the load. 2. Know the basic crane capacities, limitations, and job site restrictions, such as the location of power lines, unstable soil, or high winds. 3. 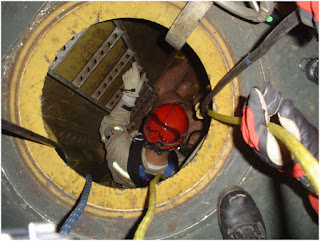 Make other personnel aware of hoisting activities. 4. Barricade areas within swing radius. 5. Ensure proper maintenance and inspections. Use ladders to get to the upper portion of the cab. 3. DON’T STAND UNDER SUSPENDED LOADS. 1. Signaling and effectively communicating with the crane operators is almost an everyday routine for the roustabout personnel, we can’t over emphasis how important sign-communication is in a very noisy working environment most especially for heavy equipment operators. 2. Seeing how important unify communication is, world regulatory body ANSI came up with standards for hand signals for crane operators and those who wants to communicate with them. 1. Be positioned in full view of the operator and if using hand signals close enough for the signals to be seen clearly. The signal persons position must give him/her a full view of the load and equipment at all times without creating a hazard of being struck by the crane and/or load. 2. Responsible for the public and all (unauthorized personnel outside of the crane’s operating radius). 3. Be in constant communication with the operator at all times with either the standard hand signals as required in accordance with ANSI B30.5 or by direct radio communication. 4. Direct the load so that it never passes over anyone. 5. It is recommended that the signalperson wear highly visible gloves (day-glow orange, yellow or white) to distinguish him/herself from other personnel and make the signals clearer. 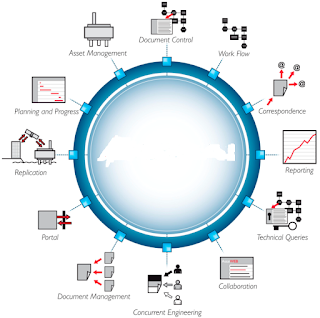 Document control could be viewed as a technological approach to governing document quality and instigating risk storming from human error in document preparation; it is achieved through process automation and is commonly used by oil and gas industry, law firm, banks, insurance providers and government agencies. Document controlling also involves the managing of the inflow and outflow of information and documents between contractors and clients. In most projects, information comes in the form of document which might be drawings, specifications, plan, instant statements or even samples and are received at a central point. On construction/oil and gas projects, this is often referred to as the document control office/department and document control centre. On a larger project although it is increasingly trendy to use the term information manager and information management centre. Unsafe act audit is a procedure design which enables an organization to identify unsafe practices of employees in the organization. Unsafe act audits therefore enables management to sense the safety climate in the worksite and take appropriate measures to prevent accidents and associated injuries. Unsafe Acts audits are conducted mainly by supervisory staff. Howwever,non-supervisory personel may also be involved whenever the need arises. It is about observing actions of people that are unsafe that may ultimately lead to accident.